Carter & Bodlovich specialize in the soothing tropical music native to Rio de Janeiro, the Bossa Nova. The compositions featured on their two albums, Corcovado and The Shadow Out Of Time, range from Bossa Nova standards by Brazilian legends Antonio Carlos Jobim and Louis Bonfa, to Carter & Bodlovich originals that fuse such styles as Samba, Calypso, Gypsy Swing and Afro-Cuban. 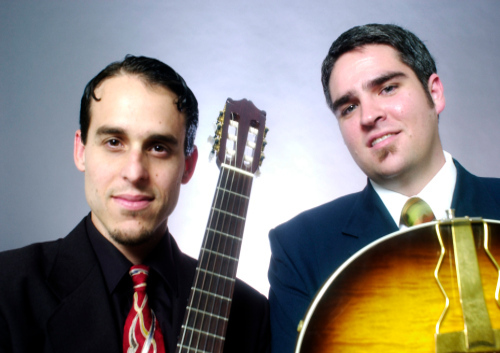 Their selection of music is the perfect complement to an elegant dining or cocktail experience, and is known to captivate audiences with its swaying Brazilian rhythms and lush jazz harmonies. Carter & Bodlovich are professional musicians who are well acquainted with the responsibilities of providing a seamless top-notch product. They have been performing wedding ceremonies, private parties and corporate events for over eight years in the Bay Area. They have worked numerous special events for such corporations as Chrysler, Compaq, Adobe, Genentech, Sun Microsystems, Macromedia and Bill Graham Presents (Live Nation). Some of the well known public venues they have performed in include The Fillmore, The Great American Music Hall, The Warfield, The Fairmont Hotel, The St. Francis Westin Hotel, The Marriott Hotel and the Hyatt Regency Embarcadero. In addition to performing in the San Francisco Bay Area, both have toured the United States and Canada.